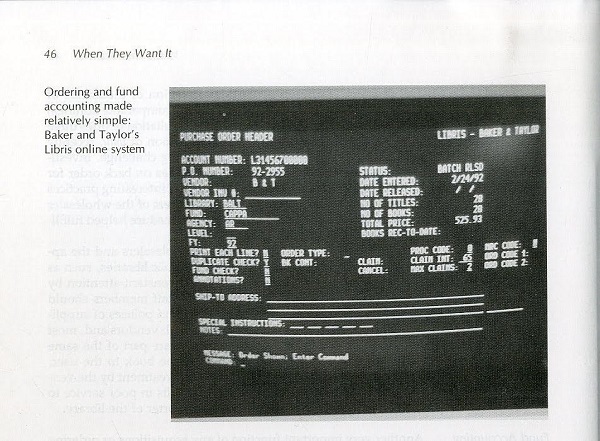 Submitter: This was not a bad choice for 1992. But holding on to it today is just sad. This was still being used at my local library. I think it’s time to update to this century. Holly: This was great in the early 1990s! 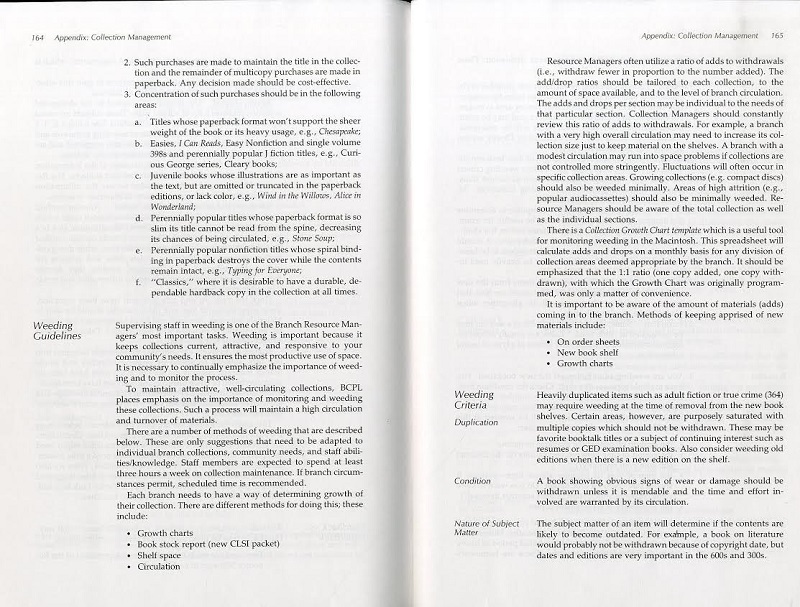 I even like the “give ’em what they want” philosophy for library management books for today. It is just too dated to be useful, though. The screen shots below (especially the Baker & Taylor ordering system) are just comical. 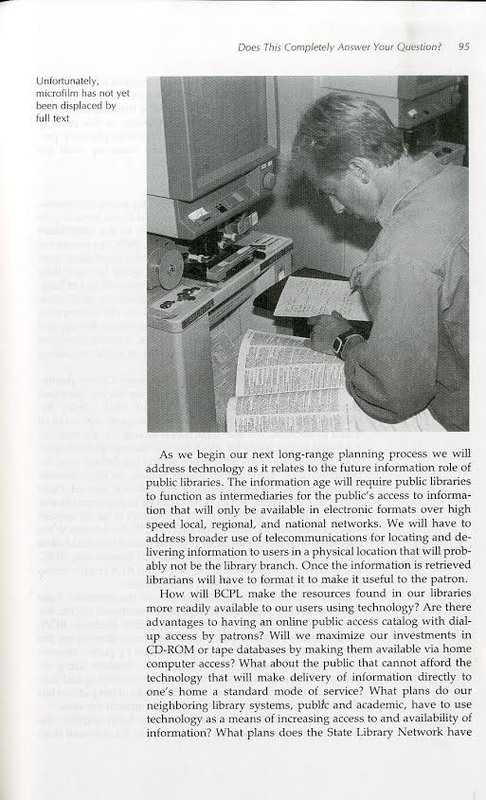 Of course technology is still part of long-range planning, as indicated in the third image below (the one with the microfilm machine), but the way that is worded is soooo 1992. Or earlier. 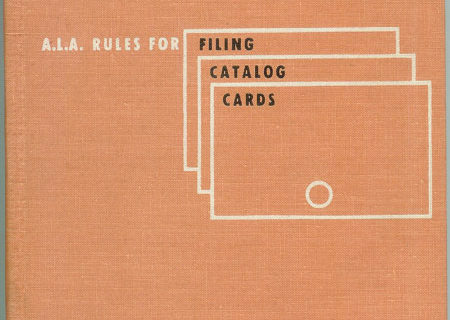 Charles Robinson and his staff made such an impact in public libraries in terms of changing the focus to customer service from book preservation and storage, which is what a lot of public libraries had been up until that time. There is a spurious apostrophe in the cover. I am triggered. I think it is there by design. It isn’t just the public library in the sense that the public funds it or is allowed to enter. 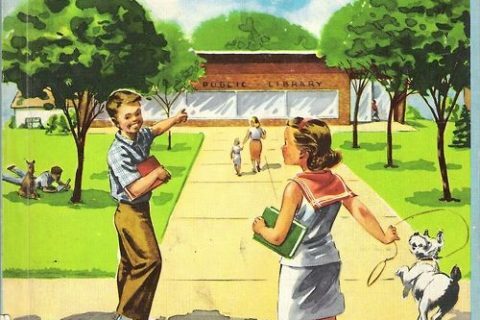 It’s the public’s library, in the sense that the patrons and their wishes should be foremost. No, I think that’s intentional — a possessive, in the sense of the library belonging to the public. I think it’s meant to catch you up and make you think. I was referring to the sign: Audios and CD’s. I should have been clearer. If I am not mistaken, Carla Hayden took over Baltimore, shortly after this book was published. Carla Hayden was head of the Enoch Pratt Library (Baltimore City). 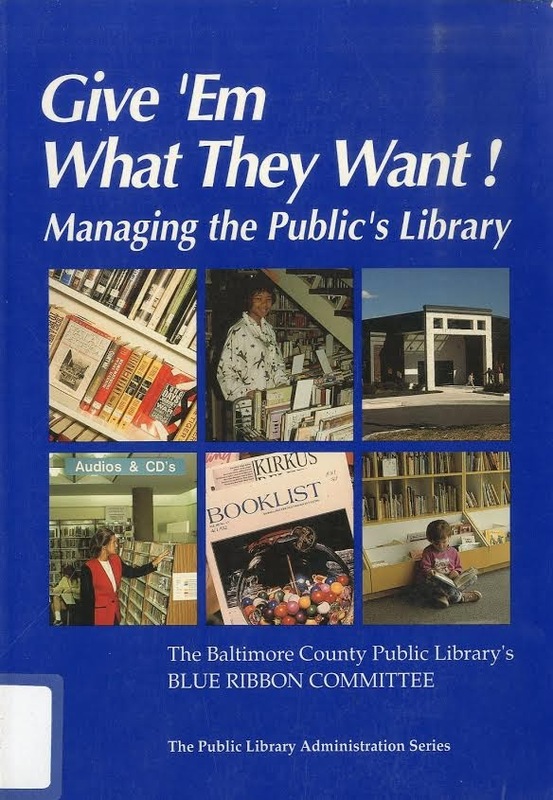 This book was written by the Baltimore County Library committee. 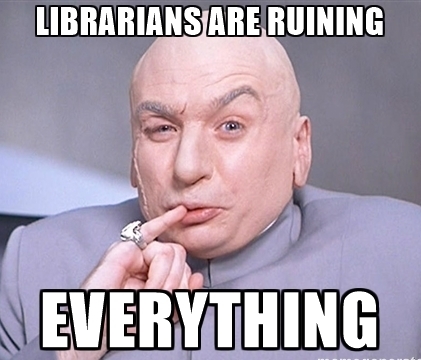 Separate governments, separate library systems. The order screen looks pretty similar to when I worked acquisitions less than 10 years ago. But it was being replaced when I left. 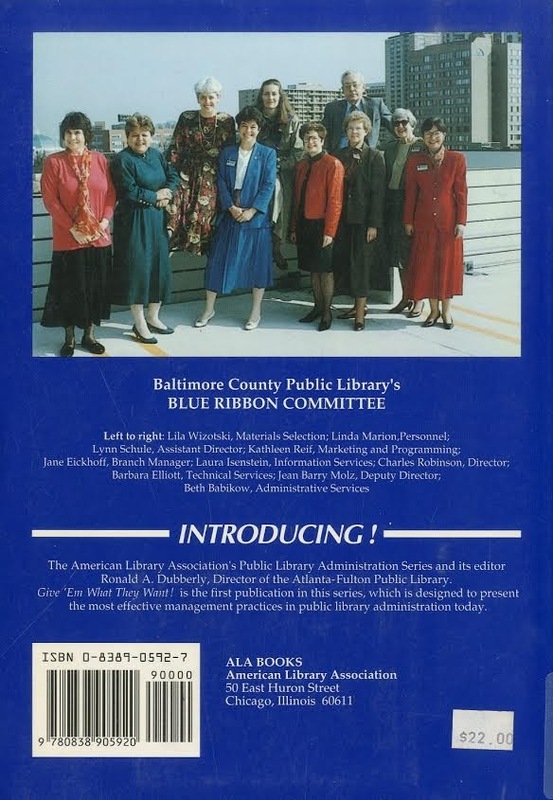 And, BOY, does the photo of the “Blue Ribbon Committee” reinforce every cliche and stereotype of the librarian, or what? I KNOW what some of our male patrons want–they’ve made it explicitly clear–but in this case, we are NOT givin’! They ought to be suppressed by operation of Law, much like the guinea-pigs in Alice in Wonderland. This is Baltimore *County* Public Library – Dr. Hayden was the director of the Enoch Pratt Free Library in Baltimore *City* – two completely different jurisdictions (and Baltimore City is NOT part of Baltimore County!) Dr. Hayden and Mr. Robinson overlapped as directors of their respective systems for a few years. 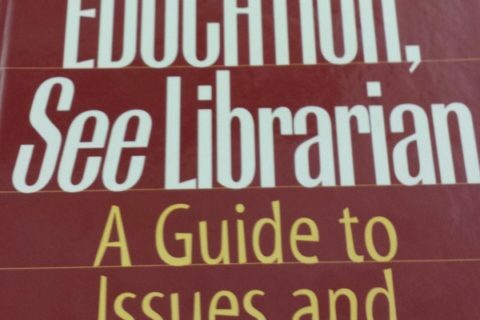 When I worked in Maryland public libraries, this book, and the philosophy behind it, was HUGE. The idea that it was okay to have multiple copies of the latest Danielle Steele while weeding unread “classics” blew more than a few minds! The late Mr. Robinson was a bit of a controversial figure at the time. And I recognize just about everyone on the Blue Ribbon Committee – boy, that was a long time ago!